Kuranda Village is a vibrant little town surrounded by World Heritage Rainforest, located just 25km north-west from Cairns on the Atherton Tablelands. This unique rainforest village put its mark on the map initially in the 1960's, as the hippie generation embraced the alternative lifestyle. As new settlers arrived they brought along with them a range of artistic talents and imagination, establishing Kuranda as an arts and crafts nexus. The Kuranda Markets soon followed with the opening of the Kuranda Original Rainforest Markets in 1978 aimed at attracting visitors to Kuranda. Open-air market stalls sold arts, crafts and local home-grown produce, whilst buskers and fortune-tellers entertained the crowds. 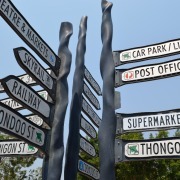 Over the years, Kuranda has become recognised a great place to shop. The markets are still a main attraction of the village today, and with the added wildlife attractions, restaurants, cafes & bars, plus the famous scenic Kuranda Train and Skyrail, the community continues to prosper. 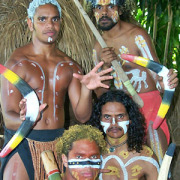 “Dja-bu-guy” is the name of the tribe of Aboriginal people who live in the Kuranda region. The land around Kuranda has been home to the Djabugay Aboriginal people for more than 10,000 years. The local Djabuguy aboriginal people call the area Ngunbay – Place of Platypus. Art and music became the unifying force between the local indigenous population and European settlers with a mutual respect and understanding that has grown over the years. 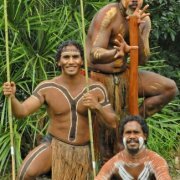 Aboriginal culture is still ever present today in and around Kuranda, where you can find traditional artefacts, fine visual arts, tribal dance (corroboree) and more. 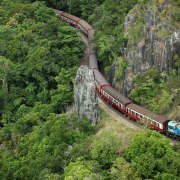 Getting to Kuranda is all part of the experience and one that you will cherish onboard the Kuranda Scenic Railway. Rising from sea level to 328m, the journey to Kuranda passes through World Heritage protected tropical rainforest, spectacular waterfalls and along the awesome Barron Gorge. 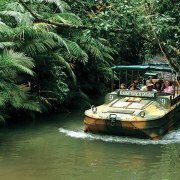 Authentic timber carriages will transport you on the journey through 15 hand-hewn tunnels and across 37 bridges, that stand as a monument to the pioneers of tropical North Queensland. 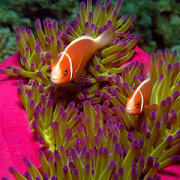 Travel time is approximately 1 hour 45 minutes from Cairns to Kuranda with two morning departures from either Cairns Railway Station or Freshwater Station and two afternoon departures from Kuranda Station. Make sure you put some time aside to explore the delightful Kuranda Station, featuring heritage-listed buildings that blend with the tropical surroundings. The Kuranda Railway Tea Rooms at the station is a great opportunity to rest, have a refreshment and enjoy the surrounds. 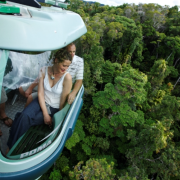 The Skyrail Cableway is a spectacular experience allowing guests a unique opportunity to observe the rainforest from above and below. Stretching 7.5km from Cairns to Kuranda, the Skyrail gondolas glide just metres above the tropical rainforest canopy before descending through the canopy layers and deep into the heart of the forest at Skyrail’s two rainforest mid-stations - Red Peak and Barron Falls. Here you can explore the forest on boardwalks and easy access walkways. Complimentary Ranger guided boardwalk tours operate regularly at Red Peak Station, and Barron Falls Station features a fascinating Rainforest Interpretation Centre and spectacular look-outs. The journey in total takes 1.5hrs one way with the gondolas operating continuously throughout the day. Each gondola seats up to 6 people and is suitable for people of all ages and abilities. 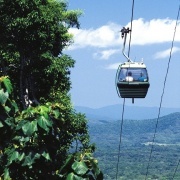 The gondola cabins can accommodate most standard type wheelchairs or Skyrail can provide the complimentary use of a wheelchair (subject to availability) during the experience. There are 32 tower sites in total with the highest being 40.5 metres (133 feet) high. Red Peak is Skyrail’s highest station at 545 metres above sea level (1,788 feet). 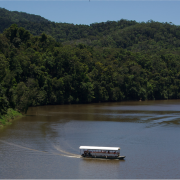 The Kuranda Station sits at 336 metres (1,100 feet) and Caravonica Terminal is only 5 metres above sea level (16 feet). Skyrail is spectacular on a fine day and sensational in the wet. 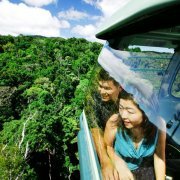 Travelling through the mist in your fully enclosed gondola cabin, you will see the rainforest come to life in the rain. This amazing experience is not to be missed, and remains the most environmentally sensitive cableway project in the world. Everyone knows Kuranda is famous for its markets. The Village features two market locations - the Original Markets and the Heritage Markets, both of which are open every day of the year. The Kuranda Original Rainforest Markets began in 1978 led by a group of local arts & crafts people looking to attract visitors to Kuranda. Today the Original Markets has retained its atmosphere, with many local artists and personalities still involved 25 – 30 years on. Renovated in 2005, this market has lost none of its rustic charm with a strong eco-conscious focus on organic, recycled, natural, holistic and remedial products. The Kuranda Heritage Markets has been established for over 20 years and is home to the Kuranda Wildlife Experience where you can enjoy a combined day visiting the Kuranda Koala Gardens, Birdworld Kuranda and the Australian Butterfly Sanctuary. Locally designed and produced clothing, Aboriginal arts and crafts, Australian made adventure wear as well as quality Akubra hats, whips, belts and accessories are just some of the goods to be found within this open plan, undercover complex. Local Aboriginal tribes design and manufacture many of the Didgeridoos and boomerangs that you will see available at the Kuranda Heritage Markets. Best buys are the hand-made local products and quality Australiana such as opals, wood-art, didgeridoos and other authentic Aboriginal artifacts. The rainforest is now easily accessible to walkers with the opening of six new walking tracks in and around the rainforest village. 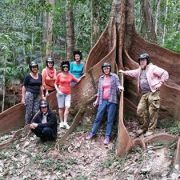 The Kuranda Rainforest Story walks, part of the Queensland Heritage Trails Network, are all linked and each provide a different experience. The Jumrum Creek Walk is an easy 30 minute walk that descends to the crossing over Jumrum Creek and climbs gently up to Barron Falls Road. Visitors can retrace their steps or link onto the well sign-posted Kuranda village circuit walk, which continues along the Jungle and River walks to the railway station and returns through the village to complete the circuit. 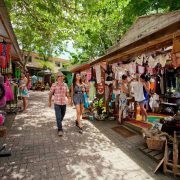 The Village Walk saunters up from the Skyrail Terminal & Kuranda Train Station, where you can wander at your leisure amongst the shops, markets stalls, cafes and restaurants. The River Walk is a pleasant 30 minute riverside stroll along a tree-shaded esplanade, this connects to the start of Jungle Walk. The Barron Falls Road Walk travels through a green tunnel along Barron Falls Road, finishing at the Barron Falls lookout – a 200 metre deep gorge in the middle of the rainforest offering sensational views. Best time to visit is during the wet season after a deluge of monsoonal rain when the Barron Falls puts on a spectacular show. 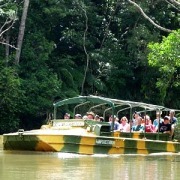 The Jungle Walk is a short 20 minute link walk to the Barron River, that passes through a regenerating forest, showing how quickly rainforest can re-establish in a cleared area. The Kuranda Backstreets Walk will take you behind the main street to see how Kuranda lives – from the Djabugay to the families of the pioneer settlers to the more recent arrivals. View local architecture that ranges from traditional tropical colonial to homemade to more modern styles. The Australian Butterfly Sanctuary is the largest butterfly flight aviary and exhibit in Australia. Home to over 1500 magnificent tropical butterflies including the blue Ulysses, Cairns Birdwing and Red Lacewing, which are all free to flutter amidst this all-weather rainforest environment. The Australian Butterfly Sanctuary breeds its butterflies from eggs laid naturally in the huge aviary, this provides them with not only all the eggs they need in order to maintain their usual population of between 1500 and 2000 butterflies, but also enough in surplus to supply other breeders in Australia - including the Melbourne Zoo butterfly house. Take a visit to the "engine room" of the butterfly sanctuary, the caterpillars breeding nursery, where you’ll see the caterpillars in their various stages of development and also get to see where some of the newly emerged butterflies “hang out” before being released into the main aviary. A 35 minute guided tour will take you through the aviary and laboratory where you can learn about the butterfly's life cycle and behaviour. Remember to wear brightly coloured clothes on the day, butterflies are attracted to bright colours! 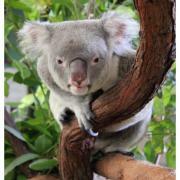 Set right in the heart of Kuranda Village within the Heritage Markets, the Kuranda Koala Gardens is a beautiful boutique wildlife park where visitors can cuddle a koala, sit down beside wallabies and get very close to some iconic Aussie animals. This intimate little park is an easy attraction to tag into your Kuranda day, and perfect as a family-friendly activity. A popular highlight for visitors is the opportunity to cuddle a koala for a treasured souvenir photo. 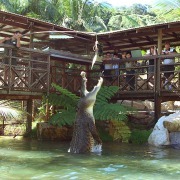 Also on display are wombats, freshwater crocodiles and lizards, monitors and other reptiles including snakes! Kuranda Koala Gardens offers a unique 'up close' experience with pythons where you can enter their domain in Australia's first 'Walk Through Snake House'. Allocate yourself about 30 minutes to take a good look around the park. 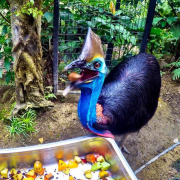 You can also combine a visit here with the adjacent Birdworld and Australian Butterfly Sanctuary as part of the Kuranda Wildlife Experience pass. Just a brief walk from the Koala Gardens is Birdworld Kuranda. Naturally landscaped with waterfalls, ponds, exotic and native plants; Birdworld Kuranda replicates the natural habitats of almost 80 species that freely roam this unque rainforest immersion exhibit. Spot cassowaries, increasingly rare in the wild, as well as bowerbirds, parrots and lorikeets. You’ll also see international visitors such as South American macaws, and have the chance to hand-feed rainbow lorikeets, cheeky cockatoos and other Australian birds. Birdworld provides a wonderful interactive and pleasant experience as the birds fly freely in the sanctuary. All birds have had regular contact with humans, and as a result are very tame, you can even hand feed them and get some great close up photos to prove it. Bird food is available for purchase on entry. 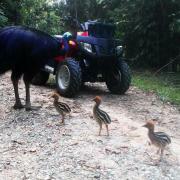 Birdworld Kuranda is open from 9.00am to 4.00pm daily, 7 days a week. 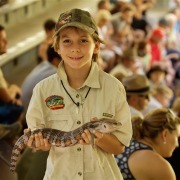 The sanctuary is nestled within the Heritage Markets and connected by walkways to both the Australian Butterfly Sanctuary and Koala Gardens, so you can easily complete the whole Kuranda Wildlife Experience in a day. 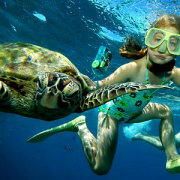 Rainforestation offers a little bit of everything - rainforest, wildlife, culture - to complete a tropical north experience. 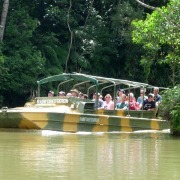 The Army Duck Rainforest Tours allow you to experience the tropical rainforest from a totally unique perspective both on land and water. 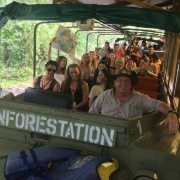 Rainforestation has 12 original World War II Army Duck vehicles, that traverse part of the property on a 45 minute guided rainforest tour. 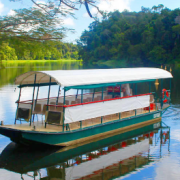 Your knowledgeable Duck Captain / Guide will point out and explain ferns, orchids, strangler figs and stinging trees, as well as birds such as the Azure Kingfisher and a host of other animals and reptiles. Handfeed the free roaming kangaroos and wallabies in the wildlife park. 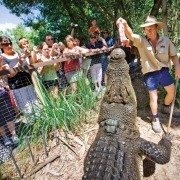 Observe the tiger quoll, and the endangered cassowary, see wombats and lace monitors, and view local snakes and other reptiles. A guided tour of the Wildlife Park will provide an indepth summary of all of the animal species, and describe the quirky traits of the individual animals themselves. The Pamagirri Aboriginal Experience takes approximately 1 hour, including the Pamagirri Aboriginal Dance Show held in the Rainforest Amphitheatre, and the Dreamtime Walk. This natural rainforest setting provides a beautiful backdrop for The Pamagirri Corroboree; a traditional dance performance depicting aspects of indigenous culture including animals, food gathering and hunting. 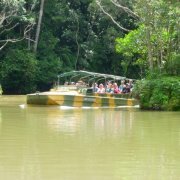 Rainforestation is situated five minutes from Kuranda Village, with shuttle-buses frequently departing for the short transfer. This attraction offers a wonderful, fun family experience and is perfect for those short of time and wanting the complete experience in one package. Never could you imagine that one tiny village could host such a multitude of dining options from around the world. 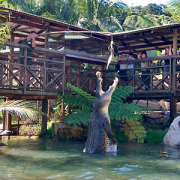 Starting with the Australiana experience why not introduce yourself to a Crocodile, Emu, Kangaroo, or Barramundi burgers at the Kuranda Village Café Bar & Grill. Sample a little taste of France at the Petit Café Creperie. Grab yourself an authentic German sausage, Bratwurst, Kransky or Weiss Wurst and wash it down with a German Beer at the German Tucker cafe. 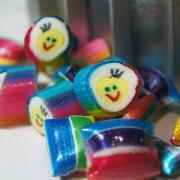 Bringing a piece of Scotland to the tropics, sink your teeth into some fresh homemade fudge, scones and shortbread at the Kuranda Fudge Bar and finally finish off with a bag of candy made fresh before your eyes at the Kuranda Candy Kitchen. For the health concious Sweet Leaf Living Foods is located in the Kuranda Original Markets, this cute, quirky little cafe serves organic fresh juices, smoothies, scrumptious salads and guilt-free sweets & snacks. The township may be reached by road via the Kuranda Range from Cairns, make sure you stop on the way to enjoy the magnificent view of the Coral Sea from the Henry Ross Lookout. 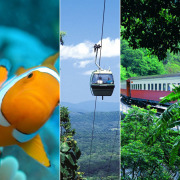 Alternatively, as part of the complete Kuranda experience take the historic Kuranda Scenic Railway to Kuranda followed by the environmentally friendly Skyrail skimming the rainforest canopy on return. 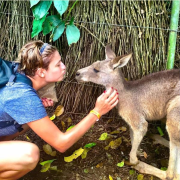 Many visitors choose to combine both of these experiences into a package, and day combos including the Kuranda attractions are very popular. 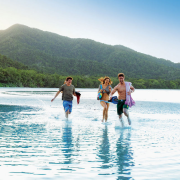 The beauty of Kuranda is that the day is flexible and can be tailored to suit.